THE MUSKET & THE CANE: A History of the Duhaime Family in North America traces the lineage of François Lemaître (our first ancestor in North America arriving in about 1651) in France to the arrival of Alexis Duhaime IV in Huntington in the 1800s. Historically significant incidents are explored in The Musket & The Cane such as Judith Rigaud's amazing and even controversial life. Researched and written over a four year period, from 1992 to 1996, new or additional research material to share for future editions is always welcome as are any comments you might have (see Contact Info box below). Acknowledgments to Carmen Lemaître-Duhaime (Laval-des-rapides, Quebec), Debbie Duheme and Gilbert Leger (Huntingdon, Quebec), Joe Dumond (Orangeville, Ontario), Eva Duheme, Mae Duheme (St. Anicet, Quebec), Lionel G. Duhaime (Fargo, Florida) and Wesley Duhame (Phoenix, Arizona)and my sister Christine Duhaime for generous access to their research material, photographs or support throughout this project. Nous sommes tous descendants directs de Fiacre Lemaistre de la France et, évidemment, j'en suis très fière. The heritage, genealogy and family history of the Duhaime, Duhemme, Duheme, Duhême and Duhem family in North America is a tale of adventure and courage as must be the history of any person who survived in such difficult conditions. This pioneer settler family of North America survived the gamut of fur traders, Indians, scalpings, wars and politics, to the Saint Lawrence River and points far West. Surnames are as old as Roman civilization. Until DNA research becomes routinely available, it remains a primary source of research into family lineage . But lineage research by surname is not infallible. Except for the last hundred years, few could read, and fewer still could write. In that context, surnames have often been misspelled, usually to fit phonetics. Even with a consistent spelling throughout history, the sources of contemporary family names vary widely. A surname may have been originally assigned to distinguish a particular family, to identify a person by a physical or character attribute or a notable event of their lives or a field of endeavour in which they have excelled or, as in most cases, their territorial origins. Jesus of Nazareth, Julius Caesar, Charles de Gaulle are just some examples of surnames that are derived from the territorial attachment of their holders. To date, the definitive origin of the name Duhaime remains a mystery. The presence of du in "Duhaime" tends to indicate a surname based on territorial origin as "du" means "from" in French. Je suis du Quebec means "I am from Quebec". So if "du" means anything, and we submit that it does, our direct ancestors were from France; at least as of the Fourteenth Century. Duhemme can be translated to mean from hemme. There are several places in France which are known as Hem or Hemme. Duhemme: Hem. bourg et marquisat de Flandres, dep. du Nord, a 2 lieues de lille. (transl: "Hem. town in the region of Flanders, North county. 2 "lieues" from Lilles"). This is persuasive evidence that the name comes from northern France, and was derived to identify those that came from Hem. Other signs point to the little village of Hem, some 15 miles east of Lille (precisely "a 2 lieues de Lille") and just south of Roubaix in the Flanders region of France, as the origin of Duheme. There are several theories as to where the word Hem comes from. Consider that of a Belgian historian who suggests that Hem comes from the word Hamma which means a strip of land that protrudes onto flooded land. The present town of Hem, France lay, prior to 1741, just south of an enormous marsh, or a hem, some 42 sq/km in size".4 The marsh was drained in 1741 to allow for rural development. One of the first spellings of Hem was Ham. Another specialist from France, suggests that Hem is a derivative of the Flemish word Heim which means refuge, home or house. This word influenced the English word ham such as in Birmingham. Another similar local name is Duhesme which is phonetically identical to Duhem. But the North American descendants of the Duhaime or Duhem lineage are not connected by blood to the Duhems of France. Our heritage is not that of Duhem, but of Le Maistre. 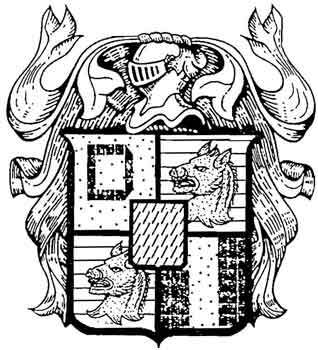 While the surname may have come from Hem, the family bloodline does not, as we shall see. That whom he could not by the sword destroy, he might supplant by the law. Chief Justice Hobart in Sheffield v Ratcliffe (1614).